Red mangrove swamp, photographed at Key Deer National Wildlife Refuge, Big Pine Key, Monroe County, in December 2014. 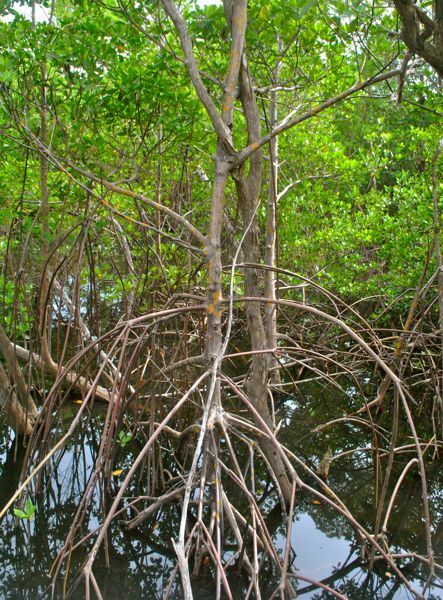 Those long roots that extend from the trunk and branches are the signature features of red mangrove, Rhizophora mangle, and earn it the name, the Walking Tree. 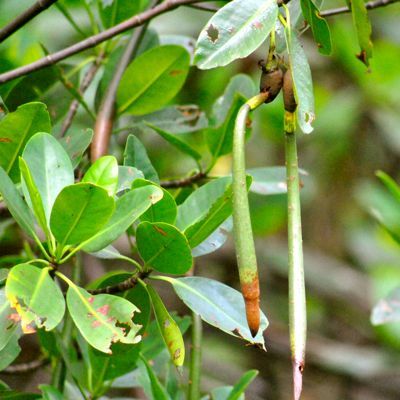 It is one of three mangrove species native to Florida, and problably the most abundant. 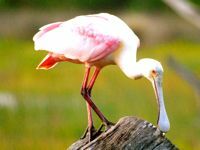 All three mangroves, red, white and black, play critical roles in Florida's ecosystems, providing food, cover and nesting places for birds and nurseries for aquatic animals, while protecting shorelines against storm surge and flooding. Mangroves tend to stratify in relation to the water and land, each species occupying its own niche. Red mangroves are found the farthest out from shore, sitting in water. They flower all year round but most abundantly in late summer. 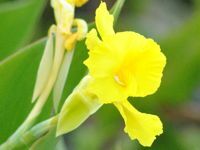 The flower is star-shaped, with four yellow petals. 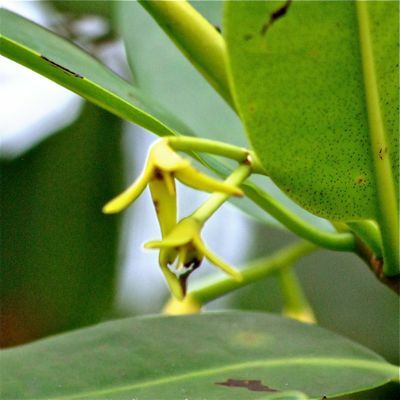 The fruit is torpedo-shaped; the seedling starts to form while still attached to the tree, dropping into the water and drifting until a suitable spot for growing is reached. Red mangroves can be shrubby or quite tall, 70 feet or more, with a crown spreading as wide as the height. Typically, however, they'll range between 20 and 30 feet. They can form impenetrable thickets. Those leg-like roots, called prop roots, both stabilize the tree and help aerate the roots. 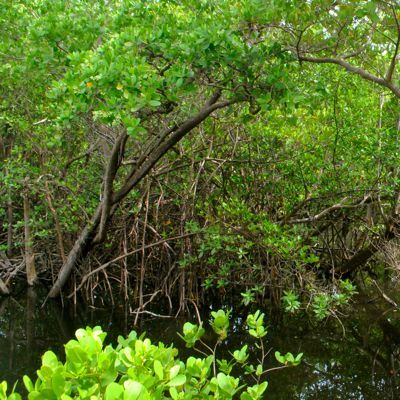 All mangroves are cold intolerant, and that limits their range. 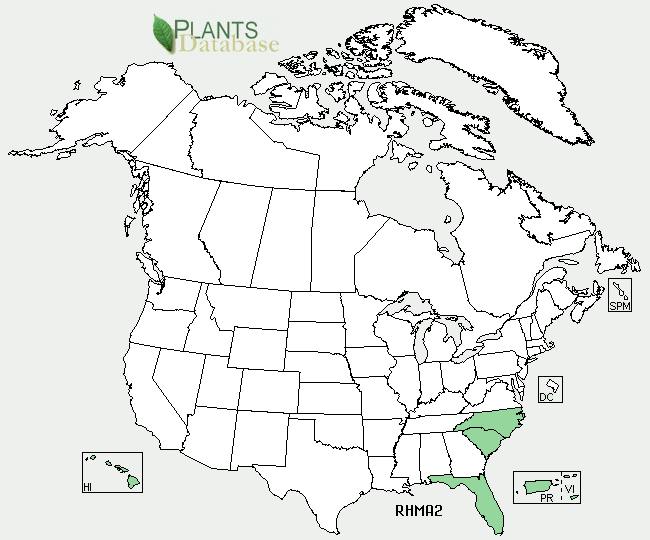 In Florida, reds can be found along the Gulf Coast as far north as Levy County and along Atlantic to Volusia. 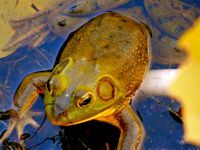 University of Florida scientists point to Merritt Island, just south of Volusia in Brevard County, as a transition zone, where mangrove forests begin to be replaced by salt marshes. 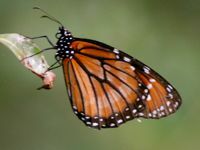 However, the U.S. Department of Agriculture say reds will range into the Carolinas, North and South. 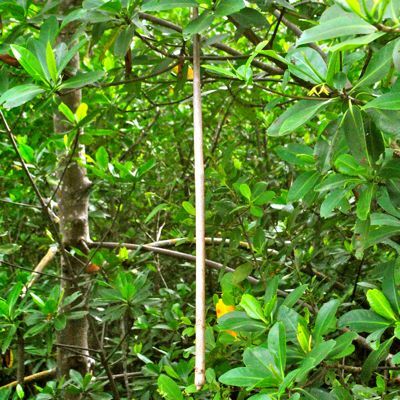 The American Sugar Co. introduced red mangroves to Hawaii in 1902, and they are now considered an invasive and a maintenance headache at places like Kaloko- Honokohau National Historical Park. 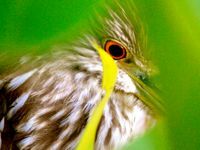 Red mangroves are also native to the Caribbean, Mexico, Central America and South America, where the wood is used for fuel, and the bark, which has a high tannin content, is used for dyes and to process leather. Tannins are also found in the leaves, which when dried can be used for tea. The leaves and fruit can be used to make a wine, and the inner parts of the fruit can be eaten if you're truly desperate and cook it well. In some places, red mangroves are used in traditional medicine — the bark to treat angina, boils and fungal infections, the leaves and bark as antiseptics and to treat diarrhea and dysentery. Red are member of Rhizophoraceae, the red mangrove family. It's also known as American mangrove.